​​​​​​Climate change, land conversion, and urbanization all have powerful impacts on the well-being of people and the planet. However, these patterns are not always perceptible at ground level or over short periods. Long-running earth observation programs such as Landsat provide critical perspective to support analyses and planning to assist climate change adaptation and overall development efforts. The Landsat Program, jointly managed by NASA and the United States Geological Survey (USGS), is the world’s longest running earth observation system, providing comparable data since the first Landsat satellite and sensors were launched in 1972. The value of Landsat project is reflected in the multiple times the US government has authorized and funded the deployment of overlapping missions including the currently active Landsat 7 and Landsat 8 missions. The Landsat 9 satellite platform is currently under development and scheduled for launch in 2023. In 2008, the USGS announced plans to make all Landsat data freely available for public use. As a result, downloads of Landsat data increased from less than a million total in 2008 to more than 42 million by June of 2016. Each pixel of a Landsat image represents 30 x 30 meters on the ground--a spatial resolution suited to characterizing land cover distribution and change over large areas. 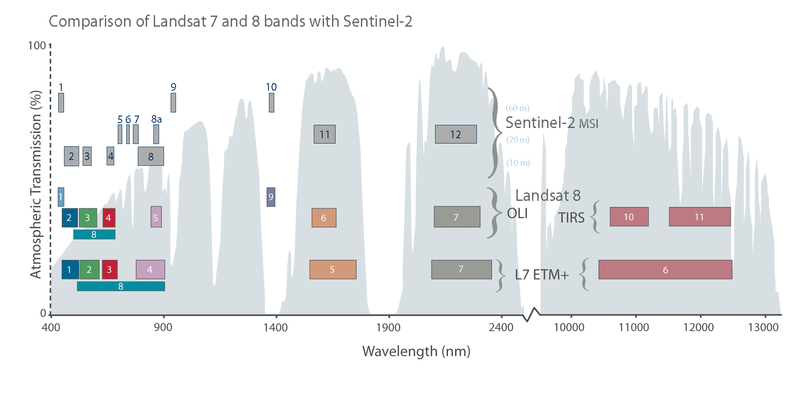 The Landsat instruments all measure visible and infrared portions of the electromagnetic spectrum in energy from the sun that has been reflected by the earth’s atmosphere and surface. By combining measurements from multiple “bands” or portions of the spectrum, analysts can optimize recognition of phenomena such as bare ground, water, and green vegetation. This flexibility means that Landsat data is frequently applied in fields as diverse as climate change monitoring, agricultural forecasting, land cover change detection, and urban planning. Recognizing the wide application value of the rich and growing Landsat data archive, SERVIR-Mekong has prioritized capacity building and application development efforts to ensure that regional stakeholders can access and use Landsat data to improve decision-making. Together with the US Department of the Interior – International Technical Assistance Program, SERVIR-Mekong conducted an interactive “Landsat Expert Training Course” in 2015. Subsequent events, such as a regional Mangrove Mapping and Monitoring Workshop co-hosted with the Silvacarbon project, have provided decision-makers with decision support tools that leverage Landsat data for improved management of ecosystems and climate change adaptation planning. SERVIR-Mekong is working with partners to develop decision support systems that use the power of cloud computing provided by Google Earth Engine to gain insight from the extensive Landsat archive in ways that were simply not possible as recently as 10 years ago. The first of these, a Surface Water Mapping Tool, uses automated surface water detection rules to uncover patterns of flooding and seasonal water distribution over months or years. In another effort, perhaps its most ambitious to date, SERVIR-Mekong is working with institutions throughout the Lower Mekong Region to design and implement a Regional Land Cover Monitoring System that will deliver high-quality, consistent regional land cover products on at least an annual basis.